Arkansas Gov. Asa Hutchinson speaks during a news conference in March 2017. Nearly 4,000 Arkansans lost their Medicaid expansion coverage in October because they failed to comply with the state's new work requirement, joining 8,462 other low-income adults who lost benefits in the previous two months. State officials reported Thursday that 3,815 of the 69,041 people subject to the so-called community engagement requirement in October were noncompliant for three months and were dropped from Medicaid. They will lose coverage for the rest of 2018 and can only reapply in January. The total number of people cut off of coverage in October in the state's Medicaid expansion program, dubbed Arkansas Works, was 15,081. Of that number, 25% were axed due to noncompliance with the state's requirement that they spend at least 80 hours a month working, volunteering, going to school or receiving job training, while 28% were dropped because they failed to supply the requested information. The state said 6,002 additional people have been noncompliant for two months and are at risk of losing their coverage at the end of November. Only about 1,525 of the 69,041 people subject to the work requirement in October reported meeting the 80-hour-per-month work requirement. Total enrollment in Arkansas Works now stands at 245,553, down 12% from 279,602 when the work requirement started in May. Arkansas Gov. 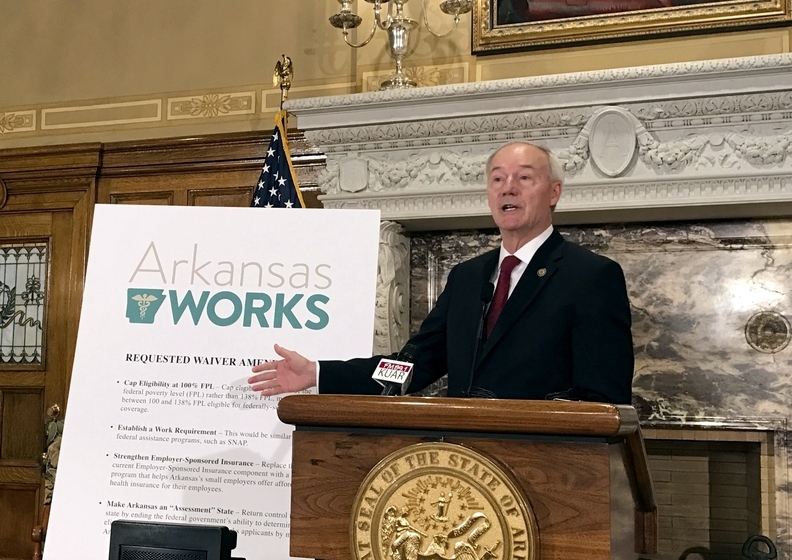 Asa Hutchinson said in September that the program's goal is to boost labor participation and increase work training and assistance to able-bodied people who want to work. The Republican cited state data showing that about 1,000 people gained job training or employment as a result of the program. But experts and provider groups have expressed alarm about the coverage losses and the viability of the state's complex work and reporting requirements. Beneficiaries can only report through an online portal. The Arkansas Hospital Association has said it would like to see the requirement halted. Providers fear the new system will disrupt care for people with chronic conditions and drive up uncompensated-care costs. Medicaid and CHIP Payment and Access Commission Chair Penny Thompson recently urged HHS Secretary Alex Azar to pause disenrollments pending closer examination of the structure of Arkansas' program. She also noted that the state has no CMS-approved evaluation design in place to study the effectiveness of the five-year work requirement waiver program, which was approved by the CMS earlier this year. "The low level of reporting is a strong warning signal that the current process may not be structured in a way that provides individuals an opportunity to succeed, with high stakes for beneficiaries who fail," Thompson wrote to Azar on Nov. 8. In a Nov. 1, 2018 letter to Arkansas' Medicaid director, the CMS itself was critical of the state's evaluation approach and requested a revised design. The letter said the state's declared evaluation outcomes, such as "culture of work" and "personal life stability," are not well-defined. It also said the revised evaluation design should include an assessment of outcomes for people who are disenrolled for failure to comply with the work requirements. For example, the CMS said the state should study whether losing coverage is associated with poorer health outcomes. Meanwhile, U.S. District Judge James Boasberg in Washington is hearing a lawsuit challenging the CMS' approval of the Arkansas Medicaid waiver permitting the community engagement requirement. In June, Boasberg invalidated the CMS' approval of a similar requirement waiver in Kentucky on the grounds that the agency did not adequately consider its impact on coverage. Following that ruling, the CMS held a new public comment period on the Kentucky waiver and is expected to re-approve it in some form. Two other Republican-led states, Indiana and New Hampshire, also received CMS approval this year for a five-year demonstration waiver to establish a community engagement requirement. Their programs haven't started yet. It's possible that the New Hampshire Legislature—with Democrats in control of both chambers after this month's midterm elections—will try to block the program from going forward. Ten other states have requests pending to establish similar Section 1115 demonstrations. In addition, there are discussions in Idaho, Nebraska and Utah, three states where voters just approved Medicaid expansion, about including a work requirement. Similar discussions are taking place in Montana, where voters just shot down a tobacco tax to fund a renewal of Medicaid expansion, and in Alaska, where an anti-expansion Republican was just elected governor. The Trump administration in January encouraged states to seek work requirement waivers. In Arkansas, beneficiaries must report that they were either meeting the community engagement requirement or that they qualified for an exemption, such as for a disability. They can only report through an online portal run by the state Department of Human Services. There is no option for reporting by phone, mail or in person. Many beneficiaries have not been contacted about the new work and reporting requirements and either aren't aware or don't understand them, according to a recent report by the Kaiser Family Foundation. Enrollees may be hard to reach by phone due to unstable housing or other factors, and a large percentage lack email or internet access, the report found. In addition, the online reporting process is complicated and confusing, even to advocates and providers that have tried to help beneficiaries. "The most likely reason for noncompliance is that (Medicaid expansion enrollees) simply do not know about the new requirements or else do not know about or understand the online portal they need to navigate in order to successfully comply," said Bruno Showers, senior policy analyst at Arkansas Advocates for Children and Families. "I hope that next month's report will bring better news, but that seems very unlikely unless changes are made to how the program is being implemented."